The details of my heritage are a little fuzzy. For two of my grandparents, we know little about their parents other than that they lived in New York City for at least one generation, but possibly longer, and we think that they were a mix of European decent. For the other two of my grandparents, we know that they were first generation Americans, with parents from Ireland, Germany and Norway. The more recent immigration of my great grandparents was always something that resonated with me, and thanks to my Norwegian maiden name and blonde hair, I often felt strongly connected to my Norwegian roots. Over the years, my family hasn't maintained a strong cultural identity, but there are a few things that have carried through, and one of them is the Norwegian krumkake cookie. It's a thin cookie, that you make with batter and hot iron, similar to an Italian pizzelle or a crunchy crepe. 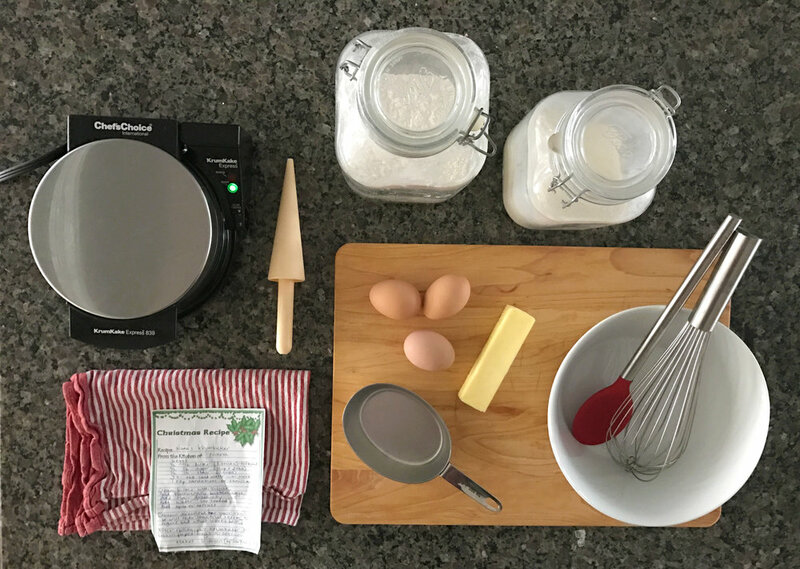 For me it is a reminder of childhood visits with my dad's parents—and I recently attempted to create my own krumkake to share this tradition with the boys. The recipe is so easy—it's basically like making pancake batter from scratch. Once you get the right batter consistency and the hang of how long to cook each kramkake, it is a really easy process. Cream butter with sugar. Add thoroughly beaten eggs. Gradually add flour. Add water as needed. Add vanilla. Pour the batter onto the hot iron. Roll cooked krumkake and place on brown paper bag to cool. Makes about 20.